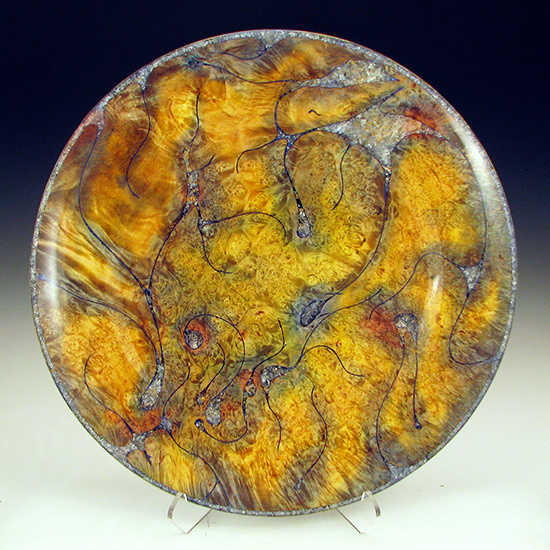 Materials: Bigleaf maple burl with inlaid minerals. Finished with metal-acid dyes and musical-instrument lacquer. Comment: This is an unusual free-flowing piece where bark inclusions were replaced with clear crystals and radiant tendrils added. Dyeing and airbrushing accented the inlays. The inspiration is the internet "cloud" of interpersonal but often impersonal connectivity.